On May 7, 2018, Environment Minister George Heyman introduced Bill 19 – 2018, the Protected Areas of British Columbia Amendment Act, 2018. An amendment to the Act included: ”…renaming of three Class A parks to reflect Indigenous names (Boya Lake Park, Brooks Peninsula [a.k.a. Mquqwin Park] and Roderick Haig-Brown Park)”. The Secwepemc name chosen is Tsútswecw Park. The indigenous word “Tsútswecw” (pronounced choo-chwek) translates to ‘many rivers.’ Please listen to the attached linked audio file to learn the proper pronunciation. A formal naming ceremony is being planned to be held as part of the upcoming Salute to the Sockeye Festival opening ceremonies on September 30. 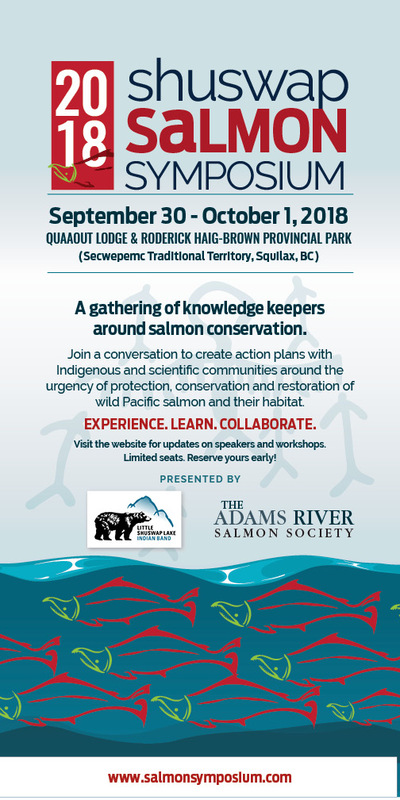 Ths Shuswap Salmon Symposium will be held September 30 – October 1, 2018. Join the conversation. Every fourth year is a “dominant” salmon run, with millions of fish to be seen (2018 and 2022 will be dominant runs). The Adams River Salmon Society coordinate the celebration known as the “Salute to the Sockeye” during the dominant years. The following years are “sub-dominant” runs of sockeye: 2019, 2023. These years often have substantial returns of sockeye and offer excellent viewing opportunities. During the last three weeks of October in years where there isn’t a “dominant” or “sub-dominant” return, a small number of salmon begin their spawning cycle. 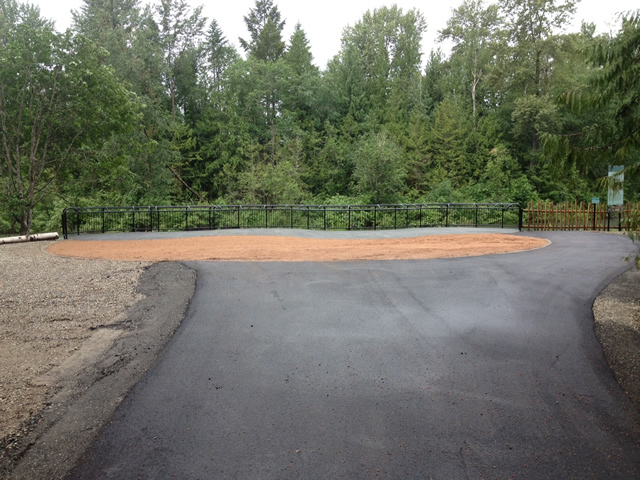 The best place to view spawning salmon is the new viewing platform approximately 300m west of the parking lot. Note that this park does not offer any camping facilities. The 26 km trail system is used for for hiking and mountain biking in summer and cross country skiing and snowshoeing in winter. Huihill Creek was recently added to Tsútswecw Provincial Park as a result of recommendations made in the Kamloops Land and Resources Management Plan and is now officially a portion of Tsútswecw Park. Special Features: The Adams River squeezes through a narrow canyon portion of the valley to create spectacular rapids that are enthusiastically used by rafters and kayakers. This park has a beautiful waterfall on Bear Creek that is viewable from the Flume Trail System. Damage from past flooding, combined with high water levels has made some portions of the river’s banks dangerous. Please use caution along the river. A popular whitewater rafting and canoeing river, the Adams is very dangerous. Wear life-jackets at all times and exercise extreme caution as there are numerous log-jams and sweepers that are not always visible in advance. Navigation below the bridge is not recommended. Inner tubes and air mattresses are not recommended for travel on the Adams River. Several people have been killed while using these devices. Poison ivy grows along dry, exposed sloped in this area: do not touch! The plant can be identified by glossy green leaves in groups of 3, with white berries close to the stem. The leaves turn scarlet in autumn and then fall off. Poison ivy is harmful at all times of the year. The trails in the lower portion of the park are near the river and subject to flooding each spring. As a result, trail maps may be inaccurate and caution should be taken along the river banks. Due to shallow and swift flowing, cold water and hidden undersurface hazards, swimming, diving and cliff jumping is highly discouraged on the Adams River or near the Adams River Gorge. Please be advised not to leave any valuables in your vehicles while hiking the trails, there have been a number of vehicles related break-in within the Shuswap area. Keep all dogs out of the water! Ensure that nothing harasses the fish--they are extremely sensitive to any kind of disturbance, and dogs are perceived as a particular threat. During the Salute to the Sockeye festival, there is treated drinking water provided on site. The water from the river is not drinkable. The park is located on both sides of the Adams River, between Adams Lake and Shuswap Lake. The entrance to Tsútswecw Provincial Park is 5 kilometres from Squilax on the Squilax-Anglemont Highway. To get to the Main parking lot and Information area, once at the intersection of Squilax and the TransCanada Highway, head north on the Squilax-Anglemont Road for approximately 5.4 kilometres, watch for roadside signage. Scotch Creek, Sorrento, Salmon Arm, Kamloops and Chase are the closest communities to this park. The Nature Trust of British Columbia, a leading land conservation organization. These properties are still under long-term lease to the BC Ministry of Environment. Though originally named after Roderick Haig-Brown (1908-1976) the conservationist, in 2018, the park was renamed at the request of the Little Shuswap Indian Band to reflect ancestral connections. The new name, "Tsútswecw," is the traditional Secwepemc name, and translates to "many rivers. Cultural Heritage: Tsútswecw Provincial Park encompasses a river-eroded landscape with a variety of cultural heritage sites. Archaeological studies of the area have uncovered evidence of large settlements. Home to the Shuswap people, kekulis (pit houses), artifacts and pictographs can be seen in the area and are strictly protected. 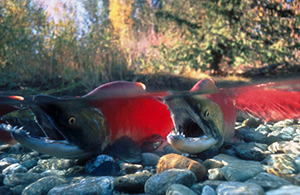 Conservation: The park encompasses the spawning beds of the sockeye, chinook, coho and pink salmon. The wooded area surrounding the river contains a natural assortment of trees including the Douglas-fir, cottonwood, birch, alder, ponderosa pine, hemlock and cedar. The park is also home to numerous forms of birds and mammals including whitetail and mule deer, black bears, beaver, river otter, mink, bald eagles and osprey. Visitors in October, 2018 and every fourth year following will marvel at the spectacle of two million sockeye salmon spawning in the Adams River. For more information, visit the Adams River Salmon Society. The year after each large run is also worth a visit as over 300,000 fish return. Wildlife: Wildlife is abundant in this riverside area, and includes whitetail and mule deer, black bear, beaver, river otter, and mink. During the salmon run, eagles are often seen. Professionally guided whitewater rafting as well as whitewater canoeing and kayaking take place on the Adams River. Life jackets and helmets should be worn at all times while on the river. This river has dangerous sections that include numerous sweepers and log jams that are not always visible in advance. Always exercise extreme caution. Navigation below the Adams River bridge is not recommended. Bicycles must keep to existing roadways and trails. Bicycle helmets are mandatory in British Columbia. Bikes are not permitted in the canyon area of the Wade Road trails, and in the “Flume Trails.” Both the upper and lower Flume Trails are closed to biking due to visitor safety concerns, physical geography and trail design. Please refer to park maps for restricted areas. Angling for rainbow trout, Dolly Varden and white fish is a popular activity. Productive sites include the canyon and the river mouth. Single barbless hook catch and release only. The Adams River is closed to salmon fishing. Note: There are special regulations for the Adams River. Anyone fishing or angling in British Columbia must have an appropriate licence. Hike the 26 km of trails – the Lower, Wade Road and Flume trails. For your own safety and the preservation of the park, obey posted signs and keep to designated trails. Shortcutting trails destroys plant life and soil structure. Pets/domestic animals must be on a leash at all times and are not allowed in beach areas or park buildings. You are responsible for their behaviour and must dispose of their excrement. Please keep dogs out of the water. The salmon are extremely sensitive to any kind of disturbance, and dogs are perceived as a particular threat. There are excellent opportunities to view salmon from the viewing platform and trails on the lower trail system. The Wade Road Trail System offers a great view of the river canyon and the rafters and kayakers that navigate it. Many of this parks trails are suitable for cross-country skiing and snowshoeing in the winter months. The trails are not maintained in the winter months. There are picnic tables located approximately 100 m west of the main parking lot next to the new Salute Plaza and viewing platform. This park only has pit toilets – no flush toilets. There is a wheelchair accessible pit toilet located near the Salute Plaza on the main viewing platform trail, 75m west of the Salmon Society log cabin. Please refer to park map for the pit toilet location. Some facilities and hiking trails in the park are wheelchair accessible. A new fully accessible trail is 320 m long and meanders through a lovely forest from the parking lot to the viewing platform at the river’s edge.